Casterbating – v – casting a fly line repetitively without shooting the line or adding much/any distance to the cast. You see the fish, on your own, or with a guide, and you start casting… and you keep casting… you need a little more distance and you are letting out a foot at a time… the line is in the air and things start coming a little undone as the amount of line gets longer and longer… and then it all falls apart. You dump a bunch of unorganized line on the water. You can almost hear the fish scream as they run away. If you are fishing with a guide, you can definitely hear the guide screaming. 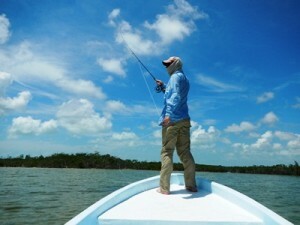 Many threats to bonefish come from above. So, in addition to just not really adding much to the actual cast, casterbating runs a good chance of just spooking the fish due to the arial movement. Maybe you’ve fished with that guy. Maybe you are that guy. Condolences either way. We’ve all been there. Casterbating is a saltwater sin, punished by the fishing gods with no delay. How do you know if you are casterbating? Did you do more than three false casts? Yes? Then you are casterbating. Maybe some day they’ll come up with a patch or some gum to help break you of this habit, but in the meantime, there are a few tips I have to keep you from casterbating, at least in public, in front of the fish. Starting point – How much line do you have out to begin with? If you don’t have enough line out, you wont’ be able to load the rod. It is pretty hard to load the rod with 5 feet of fly line out. 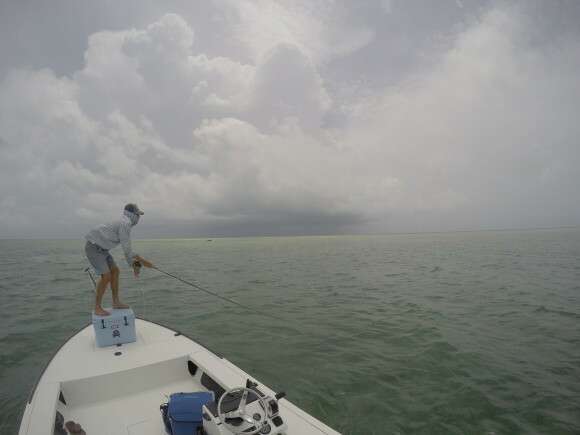 You’ll usually need 15′-20′ feet of line out the tip of your fly rod in order for there to be enough fly line to properly load the rod on your first false cast. 3 and let fly – By the time you get to your third false cast, you should be shooting your line. Past that number and you hit the point of diminishing returns. It is harder to manage line in the air. The more line you have in the air, in your cast, the harder it is to maintain and control. If you have a good loop going and are properly loading the rod, by the time you get to your third cast you have everything you need to shoot the line. Don’t let go of the line. It may seem like a good idea to let go of the line with your line-hand when you shoot the line. That is not correct. Keep the line in your hand as you are shooting the line. 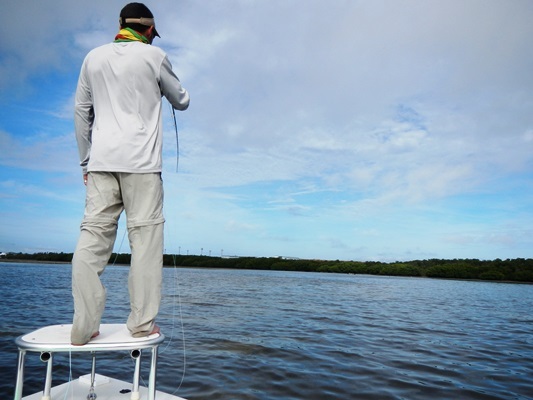 If you keep the line in your hand you’ll be ready for action when the fly hits the water, instead of grasping (and missing) the line and trying to get everything under control. There are those times when a fish eats AS SOON AS THE FLY lands. 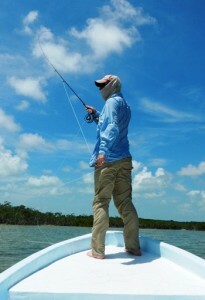 Bonefish do this sometimes, as do tarpon. If you have the line in your hand, you are ready for business. This last tip isn’t really a casterbating tip, but it’s a pretty good one anyway. If you can get away with two false casts, that’s better than three. Four casts is one too many and five is straight out. You don’t need all those extra casts. They just put a greater chance for user error into the whole enterprise. They may spook the fish. You are unlikely to get a better cast on your 8th false cast than on your third. If you are casting, your fly is not in the water and you are not fishing. So… knock it off with the casterbating. That resonated with me a bit. A second concept that has stuck with me is the idea that outcomes are not coincidental. That means if you want to improve a particular thing, you have to work on that particular thing with the goal of improving it… your main goal should not be a coincidental outcome, it should be an intentional outcome. These sorts of things float around in my head, popping up from time to time and even sometimes getting applied to my life. I was recently listening to the Freakonomics podcast and they talked about “How to Become Great at Just About Anything” where this idea of deliberate practice was discussed. This is where the 10,000 hour rule comes from, meaning to become elite at anything you need to devote a considerable amount of time, you need to put that time in with the goal of improving and you need to push yourself beyond your comfort zone. The application to fly fishing is pretty clear. Your casting won’t improve if you only pick up a fly rod 5 or 6 times a year and it won’t improve if you practice in the best conditions only and only at distances you feel comfortable with. Your casting also won’t improve if you don’t have a mechanism to elicit feedback. If you come to understand what you are doing wrong, you can’t fix it. That same sort of thing goes for writing and for singing and for parenting (probably, right?) and for surgery and for selling and for… everything you want to be good at. Take a listen to the podcast and thing about what aspects of fly fishing you could apply this to… and what areas of your own life might stand to benefit as well. OK… this is a lazy post about casting as I’m not going to do pictures or a video, but this is an important post if you have issues with your double haul. One thing I’ve seen a few times is an angler do the haul on the back cast just fine, but then the forward cast has almost no haul on it. What happens is the angler never recovers from the back cast haul. He/She ends up starting the forward haul with the hands far apart, already extended without anywhere to go. Your forward cast should start with your line hand (for me, that’s my left hand) right next to the reel. If that’s where your hand is, you can haul. If your hands are close together, you can haul. If your hands are far apart, you have no where to go. If you are out on the flat and your haul is falling apart, just remember that your back cast and forward cast should both start and and with your hands close together. I’ve landed well, I have to say. There was a rough patch when things weren’t going so well as my first marriage was crumbling and I was basically just waiting for the end. Sometimes, in those tough days, I’d grab my fly rod and head down to the school at the end of the street. I’d just go to cast and not think. Casting requires being able to block out everything else except the cast, to feel the flow of things, to get a rhythm and to just let it happen. I recently came across this video from that time of me out on that field, casting and working through it all. My cast is either a little better or worse than it was then, but I understand what that guy was going through and I’d like to just reach out and let him know… you’ll be alright.